Oval bodies, convex above and flat or hollow underneath. Never over 3/4″ long. Both have seven pairs of legs. The sowbug has two tail-like appendages that prevent it from rolling up in a ball. 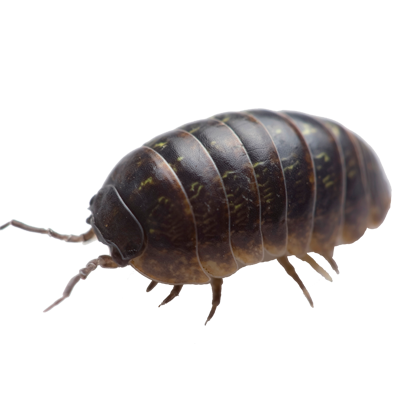 The pillbug, however, lacks these appendages and rolls itself into a tight ball.They prefer moist locations and can be found under vegetable debris or any object on damp ground. Frequently invade damp basements, crawl spaces and may infest potted plants.